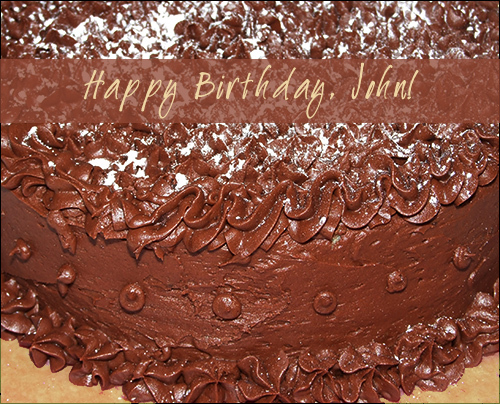 This is a homemade yellow layer cake with chocolate buttercream frosting. It’s not the neatest decorating job, but at least now I know what a cookie gun can do well, and can’t, in terms of frosting. (Next time I will use an icing bag to manually control the flow of frosting better. Notice how I blamed the tool instead of the user – hah!) Still it tastes really good, which is the most important part! Below is the recipe for both the yellow cake and the chocolate buttercream frosting, although I switched out some fo the all-purpose flour for some cake flour to give it a slightly finer texture. Combine flour, sugar, baking powder, and salt in a large bowl. Mix in milk, oil, and softened (not melted) butter, and vanilla. Mix in three eggs and stir until well combined and as smooth as possible. Preheat oven to 350 degrees. Oil 2 or 3 9-inch round pans for layers. Bake 20-25 minutes, 20 minutes for three pans, 25 for two, although each oven is different. If toothpick comes out clean, you’re done. Cool on baking rack before turning out of pan. In medium bowl, sift sugar and cocoa together to get rid of any clumps. (Can also toss them into the food processor together for a few very short bursts.) Set aside. In large bowl, mix butter and vanilla together. Add sugar and cocoa mixture. Then add milk and stir until smooth. If too thick add a teaspoon of milk at a time until desired consistency. If too runny, add a touch more powdered sugar until desired consistency. Frost yellow cake layers when completely cooled.